That means that not only is it super cute, it's inexpensive and it has all important SPF. The eos Lip Balm Sphere takes the novel idea of approaching lip balm from a different (and very ergonomic) shape and takes it to the next level with it's pretty colors and corresponding yummy flavors/scents, like the one I fell in love with, Lemon Drop which is a cheery yellow shade. (I also really loved the Sweet Mint version, which is pictured above). They remind me slightly of miniture versions of adorable Easter Eggs that I loved collecting so much as a kid! I simply twisted the top sphere top open and the balm was already in the bottom section of the sphere in a nice rounded shape. There's no need to push or twist to get the balm higher in the container. The shape of the balm allowed me to put the balm on both lips at the same time, which also made it really convienent and great when I was in a rush! 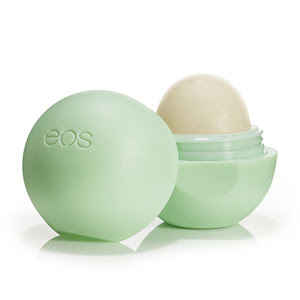 The lip spheres contain SPF in addition to being 95% organic and 100% natural, and paraben and petrolatum free. The finish was sheer, with a light moist shine, and it did a nice job moisturizing. My lips were instantly soft and smooth, without feeling greasy. The Lemon Drop tastes and smells like more of a lemon cookie than the actual fruit - there's a definate sugar component, which I liked and was not overwhelming. The Sweet Mint was really soft and yummy and left a nice cool feel on my lips from the mint. **This product was provided by EOS PR for reviewing purposes. Wow great post. Thanks alot.